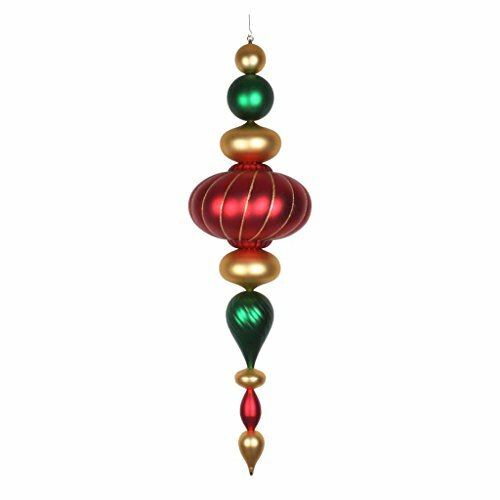 45" green-gold-red matte jumbo finial. Vickerman company is an importer and wholesaler of quality seasonal decorations including traditional and realistic artificial Christmas trees, wreaths and garlands. In addition the company offers other realistic looking holiday foliage, Giant Christmas trees and a full line of unique display trees. Club Pack of 12 Icy Crystal Decorative Large Christmas Snowflake Ornaments 9.5"
Pack of 12 "Baby's 1st Christmas" Snowgirl with Snowflake Christmas Ornaments for Personalization 4"
Pack of 6 Embellished Mercury Christmas Drop and Ball Glass Ornament 6"
Club pack of 12 Embellished Holly and Berry Finial Christmas Glass Ornament 10.25"